Using an MQTT Broker to publish and subscribe to IoT events is a critical aspect of many IoT infrastructures. And hosting your own broker retains complete control in your hands. This writing provides step-by-step instructions for installing the Mosquitto MQTT broker on a VPS running Linux Ubuntu 16.04. Don’t have a personal Virtual Private Server (VPS)? Check here to find out how to get one. Installing the Mosquitto MQTT broker on your Linux Ubuntu VPS can be broken down into 3 basic steps. And if you wish to also provide secure connections, four additional steps are needed. A telnet client is needed to install and configure the MQTT broker on your VPS. PuTTY is a widely used telnet client. It can be downloaded here. Make sure you have a telnet client installed and your non-root linux user credentials are handy before continuing. It should connect and sit, waiting for messages. You can leave this terminal open and connected for the rest of the tutorial, as we’ll periodically send it test messages. The message should be passed from one terminal to the other in the same way as the initial test without passwords. If the message was received, we have successfully added password protection to our Mosquitto MQTT Broker. Then update the firewall to support these listener ports. Note that the last listener on port 18083 is not a standard MQTT port. This port is used for insecure (non-encrypted connections). While it is not required, it can sometimes be useful when communicating with tiny IoT devices that cannot support the additional overhead required to connect using the SSL protocol. The easiest method of verifying the Websockets ports is to use a web browser MQTT client. 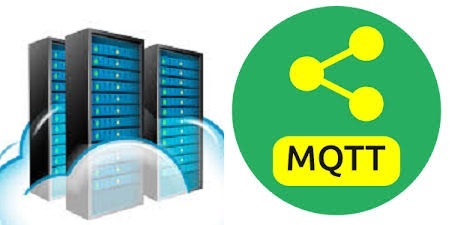 While there are many such tools available, HiveMQ will be used for this demonstration. First, open an incognito web browser window to this link. Note: You must use an incognito window. A normal browser window sends extra information to track your browsing history. This extra http traffic will interfere with the MQTT websocket protocol and cause the connection to fail. There are four steps required to securing the MQTT Broker with SSL/TLS. We must first install the official client from an Ubuntu PPA, or Personal Package Archive. These are alternative repositories that package more recent or more obscure software. First, add the repository from the VPS terminal. You’ll need to press ENTER to accept. Afterwards, update the package list to pick up the new repository’s package information. And finally, install the official Let’s Encrypt client, called certbot. Now that we have certbot installed, let’s run it to get our certificate. We can now run Certbot to get our certificate. We’ll use the --standalone option to tell Certbot to handle the HTTP challenge request on its own, and --standalone-supported-challenges http-01 limits the communication to port 80. -d is used to specify the domain you’d like a certificate for, and certonly tells Certbot to just retrieve the certificate without doing any other configuration steps. We’ve got our certificates. Now we need to make sure Certbot renews them automatically when they’re about to expire. Let’s Encrypt’s certificates are only valid for ninety days. This is to encourage users to automate their certificate renewal process. We’ll need to set up a regularly run command to check for expiring certificates and renew them automatically. You’ll be prompted to select a text editor. Choose your favorite, and you’ll be presented with the default crontab which has some help text in it. Paste in the following line at the end of the file, then save and close it. The 15 3 * * * part of this line means “run the following command at 3:15 am, every day”. The renewcommand for Certbot will check all certificates installed on the system and update any that are set to expire in less than thirty days. --noninteractive tells Certbot not to wait for user input. --post-hook "systemctl restart mosquitto" will restart Mosquitto to pick up the new certificate, but only if the certificate was renewed. This post-hook feature is what older versions of the Let’s Encrypt client lacked, and why we installed from a PPA instead of the default Ubuntu repository. Without it, we’d have to restart Mosquitto every day, even if no certificates were actually updated. Though your MQTT clients should be configured to reconnect automatically, it’s wise to avoid interrupting them daily for no good reason. Now that automatic certificate renewal is all set, we’ll get back to configuring Mosquitto to be more secure. listener 8883 sets up an encrypted listener on port 8883. This is the standard port for MQTT + SSL, often referred to as MQTTS. The next three lines, certfile, cafile, and keyfile, all point Mosquitto to the appropriate Let’s Encrypt files to set up the encrypted connections. Note that we’re using the full hostname instead of localhost. Because our SSL certificate is issued for <yourVPSdomainname>, if we attempt a secure connection to localhost we’ll get an error saying the hostname does not match the certificate hostname (even though they both point to the same Mosquitto server). --capath /etc/ssl/certs/ enables SSL for mosquitto_pub, and tells it where to look for root certificates. These are typically installed by your operating system, so the path is different for Mac OS, Windows, etc. mosquitto_pub uses the root certificate to verify that the Mosquitto server’s certificate was properly signed by the Let’s Encrypt certificate authority. It’s important to note that mosquitto_pub and mosquitto_sub will not attempt an SSL connection without this option (or the similar --cafile option), even if you’re connecting to the standard secure port of 8883. If all goes well with the test, we’ll see hello again show up in the other mosquitto_sub terminal. You can also run additional tests using the HiveMQ MQTT client again to verify the websocket port 8083, which is now configured securely. This time, make sure the “SSL” checkbox is selected when making a connection. Once this final test has been performed successfully, your MQTT broker is fully set up! With your own secure MQTT broker running on a VPS, you have a powerful platform at your disposal. Using a reliable provider, you no longer need to keep any hardware running 24-7, no longer vulnerable to power interruptions or computer crashes. And there are no constraints on your custom configuration options. That is all taken care of by the VPS provider. 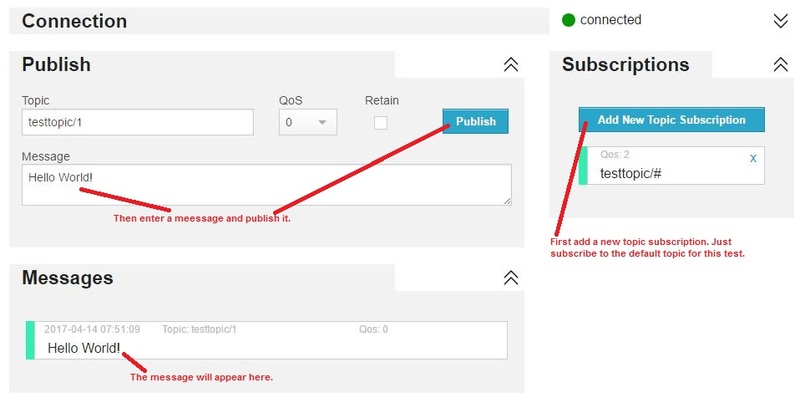 Hi There, do you know any way to publish our message on certain topic via html/php?